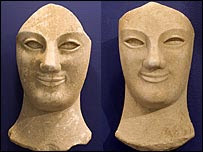 Elisabetta Povoledo ("Tempelsman Sculptures Return to Italy", New York Times, February 26, 2008) has reported on the display of the acrolithic sculptures once owned by Maurice Tempelsman and previously on loan to the University of Virginia Art Museum in Charlottesville. They will be displayed alongside other ex-Tempelsman material in the "Nostoi" exhibition in Rome. The [Tempelsman] statues ... arrived in Rome on Friday along with nine classical antiquities from the private collection of the New York philanthropist Shelby White that were ceded to Italy in January under a separate pact. Italy says Ms. White’s artifacts were also looted from Italian soil.